Bowls are simple but yet extraordinary instruments, they are widely used for playing sacred music in several cultures as Tibetan (metal bowls), recent technologies enabled building pure quartz bowl rich in harmonic sounds. Bowl sound relaxes and raises concentration. 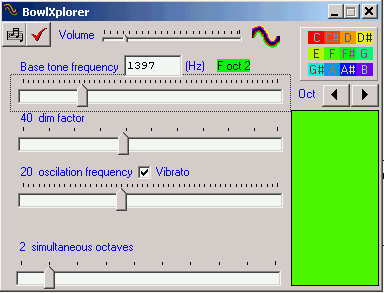 BowlXplorer is a bowl simulator, main sound parameters can be changed performing different sound effects.